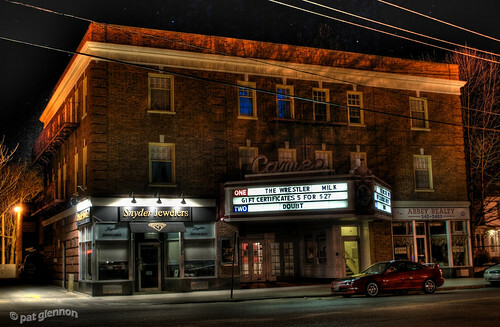 Cameo Theater (23/365 v2.0) – Annoyingly Boring? My first ever attempt at a HDR image. Some feel they are cliche and tacky, I like them. They represent what the eye sees even more so than a traditional photo in some fashion. This will probably not be my last attempt at HDR. It’s cool–but kind of confusing. (HDR not the picture, I mean, the picture is cool but I’m not confused about it. It’s a building.) So, do you stack the images to produce the end result? What’s the process? This is a very nice shot. Diggin’ it. It’s almost “The Amity Horror” -ish. A tad eerie. It’s all so clear to me now. @Ed This image above is actually a composite of five photos of varying exposures (some light some dark, some properly exposed). They are then stacked and run through a special software package. I can’t give you the technical specifics on what it does but it does what you see. I was a little confused too, but it looks cool! I love the end result. Not sure if I would have the time or patience to try it. I rarely have the time to remove the red eye in my photos! Awesome… AND I learned something! Nice one Pat! Keep going! I like HDR shots a lot. It’s cool. Funny, I’d been looking at a lot of HDR pics lately. very interesting. I have never heard of HDR before. What software do you use to do this? nice picture, I must read more about this. Pingback: Crane Windows (143/365 v2.0) « Annoyingly Boring? Nice job for the first time. .-= Jonathan – Beeps and Chirps´s last blog ..Jacob Peak =-.